Ideal for silver bullion buyers, this 125 oz Silver Stacker Bundle allows you to start your silver bullion collection or add to it with some of the world’s most prestigious silver bullion bars and silver bullion coins. 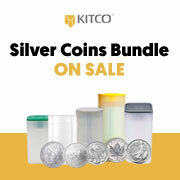 This wide selection of popular silver coins and best selling silver bars allows you to benefit from a world of diverse silver bullion refiners at one great price. The silver bar(s) or silver ingot(s) you receive may not be in absolute mint condition.